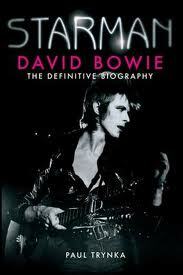 I have just started to read the above new biography on David Bowie. This will be the first Bowie biography that I have read and I look forward to what I am sure will be an interesting read. Meanwhile David Bowie will release a new EP featuring remixes of his 1975 single ‘Golden Years’ on June 6. As well as the original title track, the EP will feature four remixes by DJs Jeremy Sole, Anthony Valadez, Eric J Lawrence and Chris Douridas from US radio station KCRW. Bowie will also make a ‘Golden Years’ iPhone app available on the same day that the EP is released. It has been created by ‘Station To Station’ producer Harry Maslin and will allow fans to remix their own version of the track. KCRW are streaming a preview of the ‘David Bowie Vs KCRW Golden Years’ EP online at Blogs.kcrw.com.